Beginning like an interactive art installation, Lost Text/Found Space’s Til We Meet in England is both a meditation on the plight of refugees and a chillingly pertinent account of persecution. The audience is invited into a seemingly derelict house to observe the current inhabitants going about their daily lives: they are on the run, clutching photographs of loved ones and warily twitching at the curtains, fearful that their persecutors are at the door. Then 18th-century writer Elizabeth Inchbald, played with intensity and conviction by Pippa Wildwood, steps forward to introduce her scenes dramatising events following the St Bartholomew’s Day massacre of Huguenots in Paris in 1572. The few who escaped fled to Protestant England, haunted by ghastly memories of religion-fuelled bloodshed. The cast switches smoothly from interactive scenes to pieces of Inchbald’s original text, commanding attention throughout. Among a fine ensemble, Sanjiv Hayre and Menelik Mimano give heartrending performances as Tricastin and his missing son, while Rachel Summers’ wild-eyed Madame Tricastin urges onlookers to help pack their bags so they can flee. Lucy Harrison’s music – from folksongs accompanied on the guitar by Tom Wilson to spare choral harmonies that unite the cast – is supremely fitting. Designer Talulah Mason makes good use of the elegantly decayed rooms, while Matthew Haskins’ lighting conjures subtle effects by switching from candlelight to warm incandescent bulbs to garish fluorescent striplights. 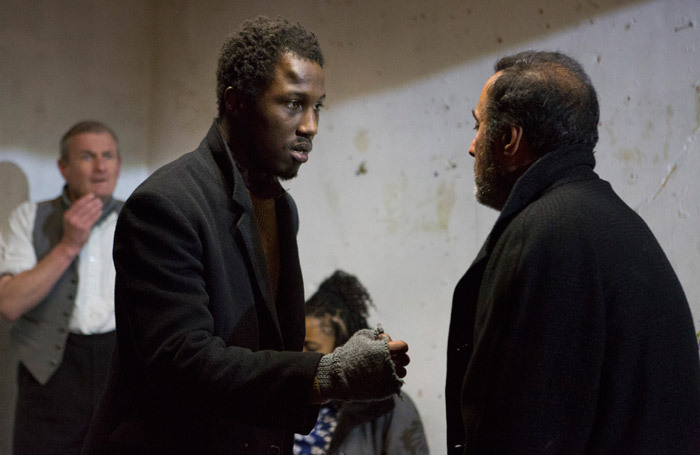 Most impressive is the fusion of linear narrative with immersive experience to connect Inchbald’s impassioned play to today’s refugee crisis without resorting to heavy-handed explanation. It provokes the question: is England still a welcoming place for those fleeing religious oppression?